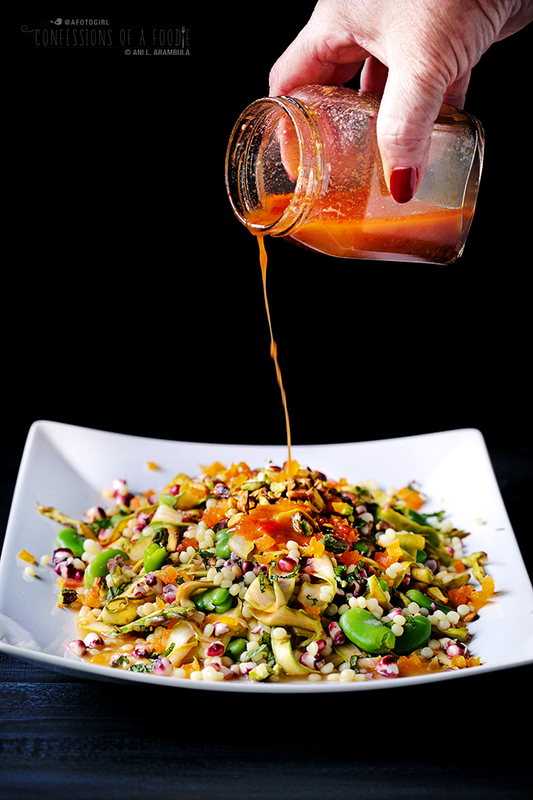 Recipe for a simple spring vegetable salad with Israeli couscous and a spicy harissa dressing featuring Mina Harissa. 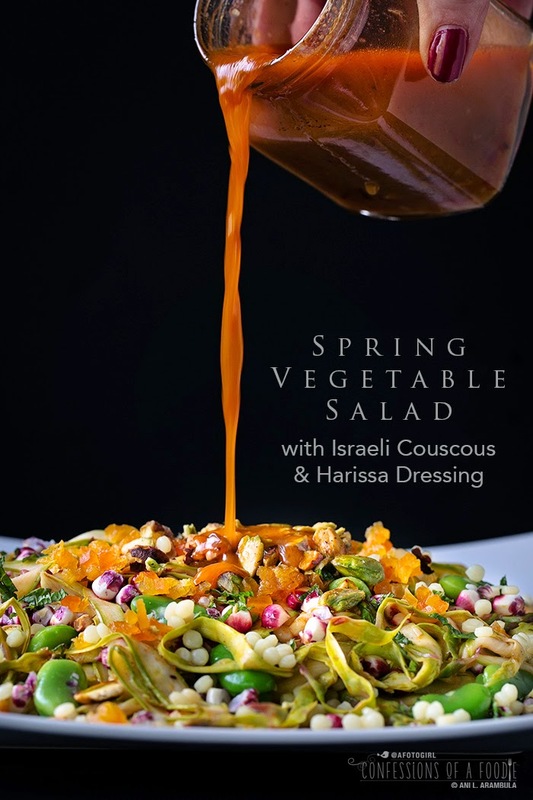 A healthy, colorful salad bursting with spring vegetables and Israeli couscous finished with an ever-so-slightly spicy dressing featuring Mina Harissa will make a tasty addition to your Mother's Day brunch this coming Sunday. 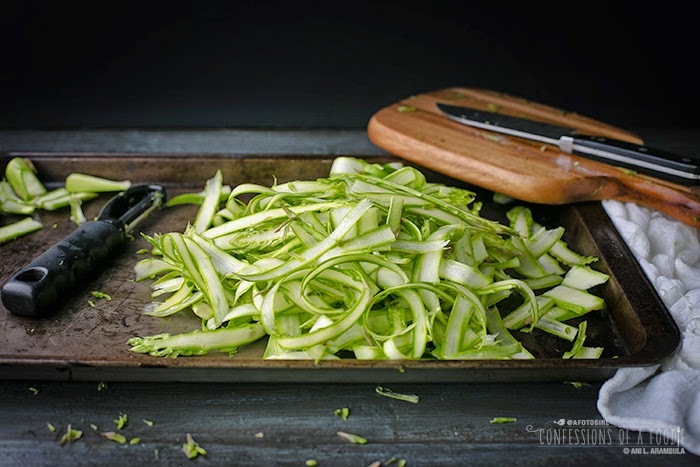 I love everything about this spring vegetable salad. 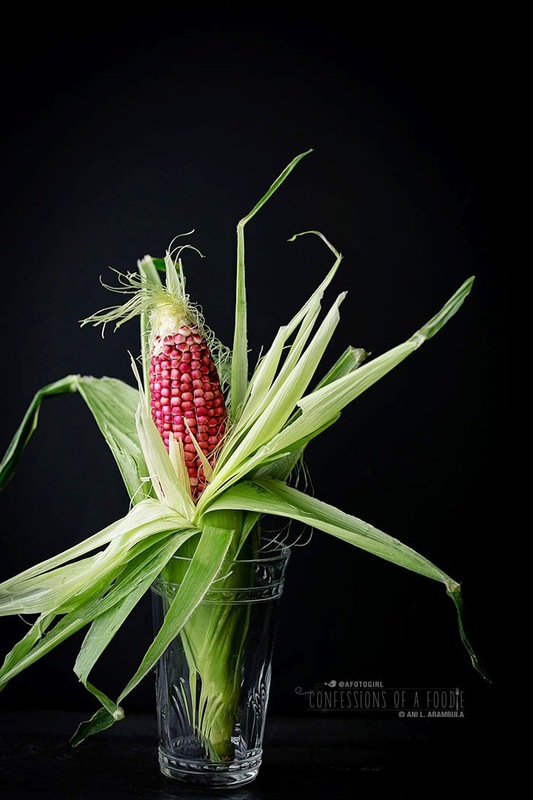 To my latest discovery of red corn. Yes! Red corn. Isn't it lovely? I picked it up at my favorite produce warehouse over the weekend and truth be told, I just saw a huge bin of corn in one of the walk-ins and knowing I wanted to add fresh corn to this salad, I just grabbed it without even bothering to pull back the husks and take a look. I never do that. I'm usually quite obsessive when picking out fresh corn in the produce aisle of my usual market. But I was in a hurry. Needless to say, I tried to play it cool when I was at the checkout and the gal asked if she could pull the husk back and see which corn I had. Sure, go ahead. And she does and I'm shocked to see it's red and she's like, oh we just got this in. Did you know it was red? Uh, no, says me, I've never seen bought fresh red corn on the cob before. It's lower in starch, she says, and if you don't want to lose the color, don't cook it in water. Instead, she adds, eat it raw or grill and I'm like, great! Thanks for the tip and inside I'm thinking, don't ruin my dish, corn. It didn't. In fact, I LOVE that it added gorgeous color and tastes really clean, slightly sweet with a nice bite when eaten raw. In the end, the star of this salad is definitely the dressing. Because, c'mon, isn't it always? Don't lie. I wanted something a little unexpected to counter balance the sweetness from the corn and fava beans. Something for that lovely, toothsome Israeli couscous (also known as pearl couscous) to soak up. I've been dipping into my stash of Mina Harissa and adding it to nearly everything these few months. Depending on what the dish is, it really elevates the humdrum to wow. Sometimes it's just a touch to add that little unexpected complexity to a sauce, sometimes it's the sole ingredient in a quick marinade, and sometimes, it's added straight from the jar to tacos. Adding it to the dressing just seemed so natural and it definitely was the spicy yang to the sweet yin of the veggies and apricot. I hope you give this one a try. Maybe even surprise mom with it on the Mother's Day brunch menu. I'm sure she'll get a 'kick' out of trying something different. This salad is pretty customizable. 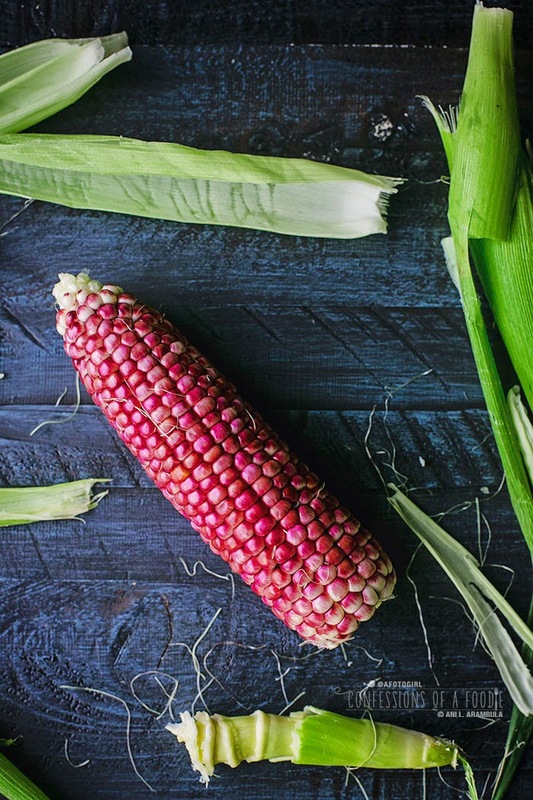 Can't find fresh red corn? Use fresh yellow or white. Don't like asparagus? Substitute it with broccolini or thinly sliced leeks. Not a fan of fava beans (gasp! ), drop in some fresh peas instead. 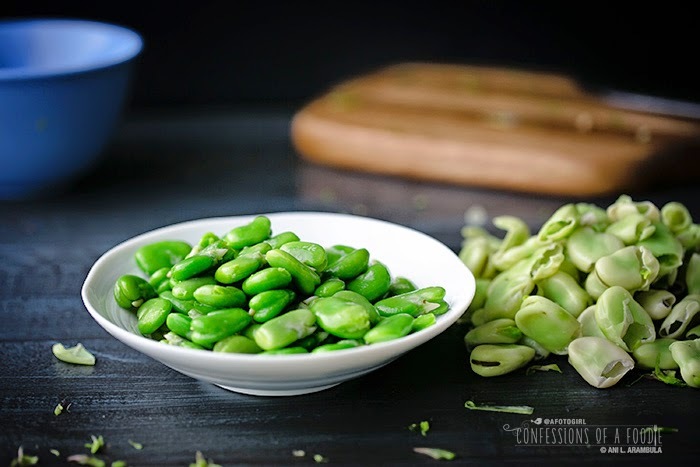 Remove fava beans from their pods. Set beans aside and discard pods. 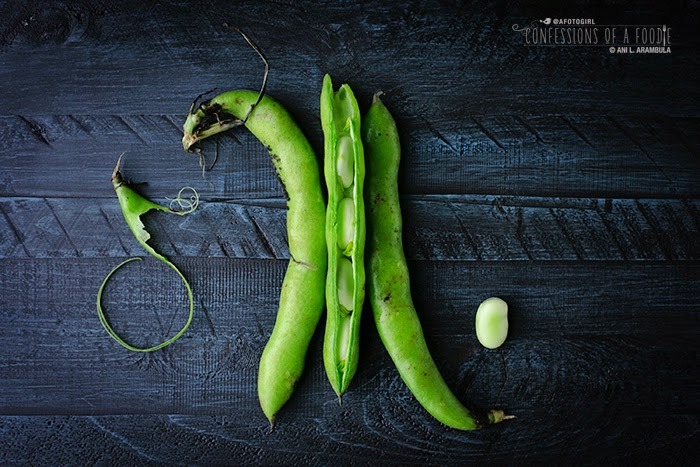 See this video for help on how to remove beans from their pods. Fill a saucepan with 4 cups of water and bring to a rolling boil. Whisk in salt. Add couscous, bring back to a boil then cover and reduce to a simmer. Cook for 9 minutes or until al dente. Using a large bowl to catch the water, drain the couscous into a large sieve. Return water to saucepan and keep on a low simmer. Rinse couscous under cool running water; spread couscous on a large rimmed baking sheet to cool. Drop fava beans into saucepan of simmering water. Cook for 4 minutes. Fill a bowl with ice water. 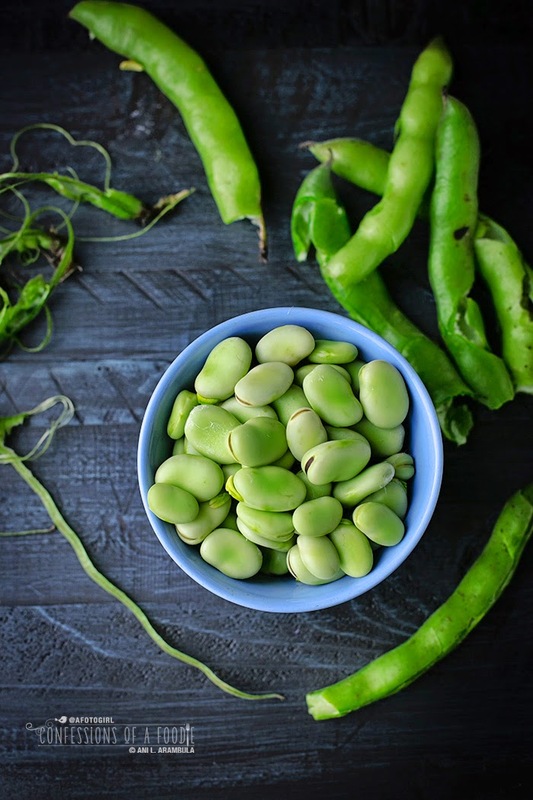 Drain fava beans and immerse them into the ice water bath to halt cooking. When cool enough to touch, pierce one end of the bean skin with your thumbnail and then gently squeeze the bean to release it from its skin. Repeat with remaining beans; set aside. 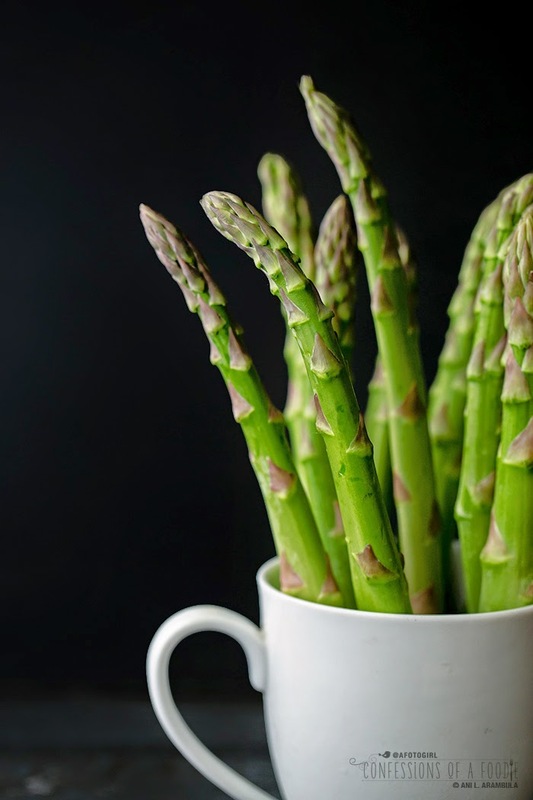 Holding the asparagus by the woody end, use a vegetable peeler to shave the asparagus into thin strips; set aside, discarding woody ends. Place a dish towel on a steady work surface. Remove husk and silk from corn cob. Rub the corn cob with a damp paper towel to remove any remaining silk; discard silk and husk. Cut the bottom end of the corn cob to create a stable bottom. 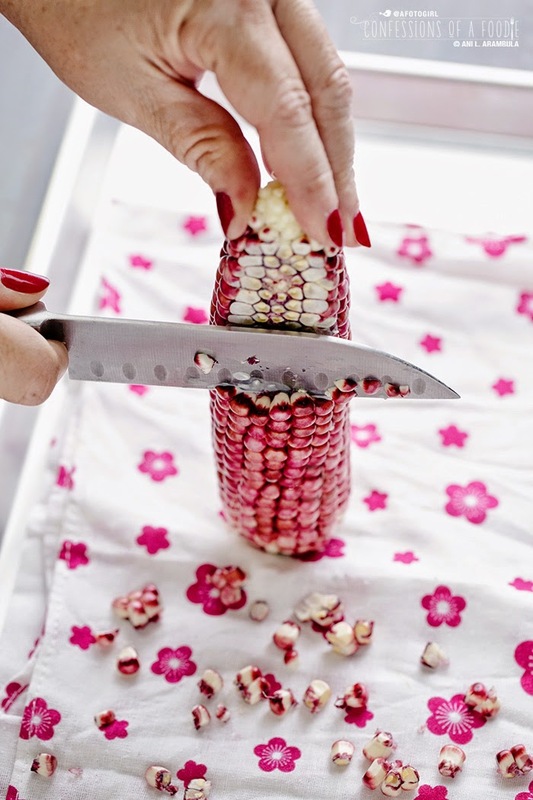 Stand corn cob upright on dish towel and using a sharp knife, cut down vertically to remove the corn from the cob, careful to keep fingers away from the blade. 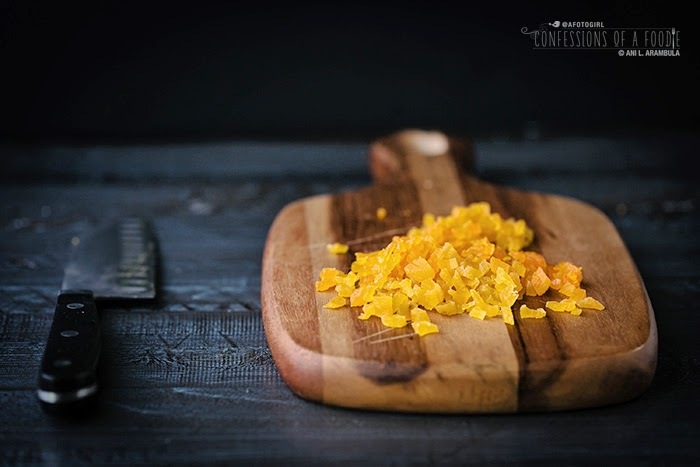 Set corn kernels aside. Finely chop the apricots, then the mint; set both aside. Heat a heavy bottomed skillet (cast iron works great) on medium heat. Gently toss in the pistachios and toast, stirring to keep the pistachios from burning. Toasting should only take about a minute or so. Remove from pan and set aside. Place a medium saucepan on medium heat. Drizzle in 1 tablespoon of olive oil. When oil is shimmering, add onions and garlic. Stir continuously, sweeting the onions until softened and translucent and the garlic is aromatic. Whisk in the apple cider, harissa, honey, Chinese five spice, sumac (if using) and sea salt. Cook, stirring, for 1 minute. Take off the heat. Whisk in ⅓ cup olive oil. Add the asparagus and toss to coat well. The residual heat will gently cook the asparagus. Let stand 30 seconds then remove asparagus from pan. To assemble, add the salad ingredients to a large serving platter or bowl. Toss to mix well, then drizzle with harissa dressing. Garnish with mint. Salad can be served at room temperature but left to chill out in the refrigerator, the flavors intensify so this can easily be made the day before serving. Keep in a tightly covered container for up to 3 days. Disclosure: I was compensated by Casablanca Foods, the maker of Mina Harissa, to develop this recipe. As always, recipe, photography and opinions are wholly my own and are not influenced by Casablanca Foods. I only accept sponsorships from products I love and use myself. 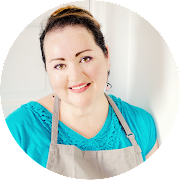 If you enjoy my recipes, please consider supporting the brands that help keep this site going. 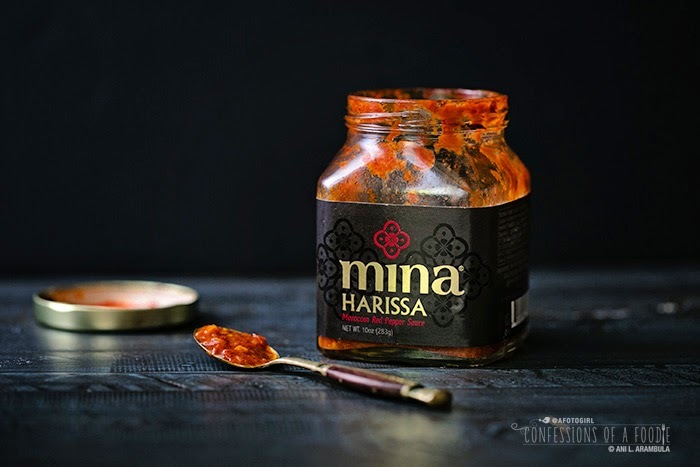 Mina Harissa is available at Whole Foods and Bristol Farms or online. Such a gorgeous Spring salad - love all the ingredients. I could see adding some chicken or poached salmon and serving this as a hot weather entrée.